The persistent inflow of alternative capital in the global reinsurance industry has enabled reinsurers to adjust their risk transfer strategies, as companies look to offset continued, and potentially damaging profitability deterioration, says Standard & Poor’s (S&P). In an effort to mitigate the negative implications of the softening reinsurance landscape, reinsurers have, for the most part, maintained underwriting discipline. By taking advantage of the features and capacity of the insurance-linked securities (ILS) market and increasingly utilising retrocessional protection, reinsurers continue to look for ways to manage exposures and sustain profitability in a soft market cycle. Catastrophe losses have been benign in recent times when compared to historical averages, and the inflow of both traditional and alternative reinsurance capital has enabled the market to remain heavily capitalised in the face of natural disasters. Growth and profits in property catastrophe lines remain challenging, exacerbated by a series of market headwinds including an abundance of capital and a decline in demand from cedents for protection against the more probable extreme cat events, says S&P. “Of the peer groups we track, the Bermudians and midsize global reinsurers have increased their retrocession usage the most in the past two years. This makes them more aligned with the other peer groups,” said S&P. The above charts provided by S&P highlight the increased use of retrocession in recent times. The inflow of third-party reinsurance capital at a time of benign losses and challenging investment market conditions does contribute to the supply/demand imbalance and broad price reductions. However, with the risk landscape continuing to evolve and the features and capacity of the ILS market providing firms with diversification benefits, reinsurers appear increasingly willing to embrace the ILS space and work with it, rather than against it. ILS capital has a strong presence in the retrocession market and is utilized by insurers, reinsurers and also non-insurance entities during renewals. But as the sophistication of the market has grown and investors and managers have both shown discipline and maturity, a desire to get closer to the original source of risk has seen insurers and reinsurers work with the space more directly. S&P continued to note that cedents’ buying habits continue to evolve and are subsequently retaining more risk. “Reasons for this shift in behavior include their better knowledge of their risk, improved capital positions, and cost saving through centralization of reinsurance purchasing for larger groups,” says S&P. 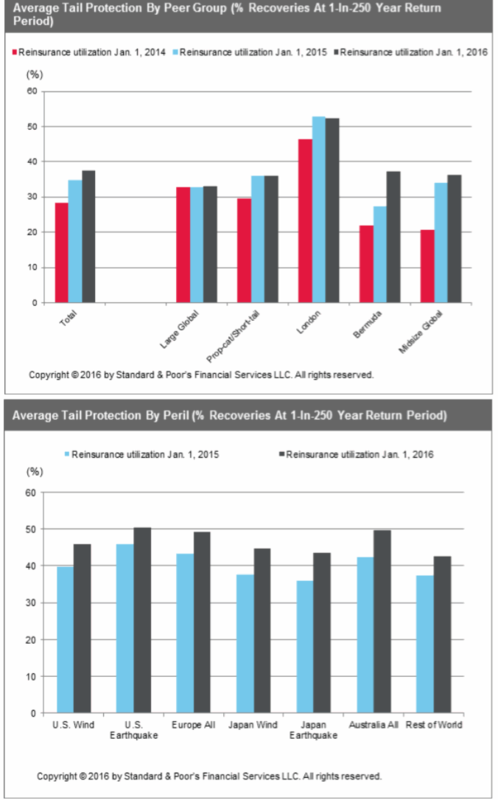 Again stressing that reinsurers are increasing retrocession usage to reduce earnings volatility. Profits are likely to remain difficult to come by as the softening landscape shows little sign of waning anytime soon, despite a notable moderation in price declines in more recent times, meaning that reinsurers will continue to look for ways to offset the impacts. Utilizing ILS capacity and features appears to be one way companies are looking to hedge some of their exposure to high-probability catastrophe events, and the growth of third-party capital has also contributed to substantial capitalization in the face of a return to more normalized losses. But despite this, S&P warns that the sector risks entering unprofitable territory should losses return to that of an above-average catastrophe year, further supporting the need for discipline and innovation in order to increase efficiency and remain relevant to the market.